After a lot of rumors and leaks, Xiaomi has finally unveiled the Mi 9, Mi 9 Transparent Edition, and Mi 9 SE smartphones in China on February 20, 2019. Both the Mi 9 and Mi 9 SE features Full HD+ 19.5:9 aspect ratio display. Here in this post, we will share with you the total 18 Xiaomi Mi 9 and Mi 9 SE Stock Wallpapers download link. The devices come with Android 9 Pie based on MIUI 10 out-of-the-box. It features dynamic wallpaper, Sunlight and Reading Mode 2.0, Game Turbo, Dark Mode etc. 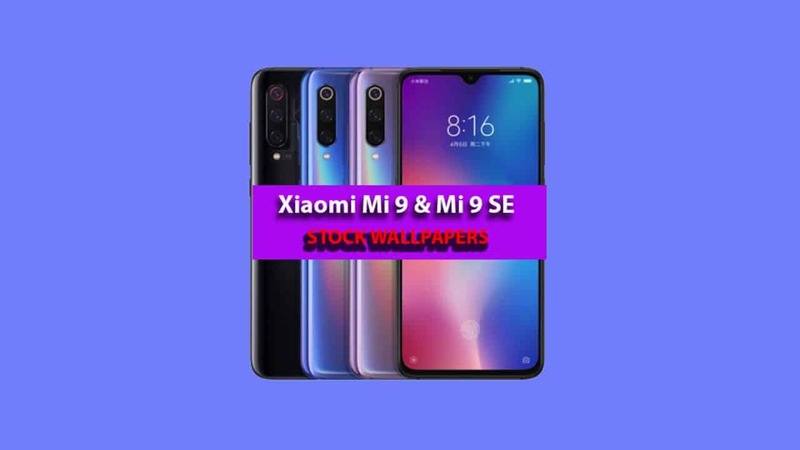 We have got the original Xiaomi Mi 9 along with Mi 9 SE stock wallpapers for you. Both the devices feature the same wallpapers of 1080×2340 pixels resolution which you can find from below. But before going to the download section, get the device specification details at first. The Mi 9 comes with a 6.39-inch Full HD+ Super AMOLED display which features HDR10, 19.5:9 aspect ratio screen with a resolution of 1080×2340 pixels. The display also comes with Corning Gorilla Glass protection, waterdrop notch, and Always-On Display support. Under the hood, the handset is powered by the latest flagship Qualcomm Snapdragon 855 SoC coupled with Adreno 640 GPU. The phone offers 6GB/8GB/12GB of LPDDR4X RAM and 128GB/256GB UFS2.1 of onboard storage variant. There is no support for expandable memory while features an optical in-display fingerprint sensor. In the camera segment, the device does have triple rear 48 MP with f/1.75 + 16MP with f/2.2 ultrawide + 12MP telephoto lens with f/2.2 sensors with a LED flash. While the front features a 20MP selfie camera with AI support. The Xiaomi Mi 9 packs with a decent 3,300 mAh battery with 20W Wireless charging and 27W wired charging support. The USB Type-C port, Wi-Fi 802.11ac, NFC, Dual Nano 4G VoLTE, Bluetooth 5.0 LE, GPS, A-GPS, GLONASS, BeiDou and other major sensors available. The Mi 9 SE comes with a 5.97-inch Full HD+ HDR Super AMOLED 19.5:9 aspect ratio display. The screen features 1080×2340 pixels resolution, a waterdrop notch, and Gorilla Glass 5 protection. The mid-range flagship Xiaomi Mi 9 SE (Special Edition) is powered by Qualcomm Snapdragon 712 chipset paired with Adreno 616 GPU. The device offers a 6GB RAM and 64GB/128GB of internal storage capacity. It also runs on Android 9 Pie out-of-the-box based on MIUI 10. Like the Mi 9, the Xiaomi Mi 9 SE also comes with triple rear cameras including 48MP with f/1.75 + 13MP ultrawide with f/2.4 + 8MP wide-angle lens with f/2.4 aperture. While the front does have a single 20MP selfie shooter with AI mode. The Mi 9 SE packs a 3,070 mAh battery with 18W fast charging support. It features an under-display fingerprint sensor as well including all major connectivity and sensors. Now, coming to the main topic, both the devices offer the same stock wallpapers out-of-the-box. Due to the bigger AMOLED and 19.5:9 aspect ratio display, all the images looks cool and trendy. The minimalistic and abstract wallpapers will fit perfectly on any 18:9 or higher aspect ratio display devices easily. Just download the (.zip) file from the given link below and extract it on your device normally into any folder. Now, go to wallpapers and choose the image to set on your home screen or lock screen easily. You can set the images from your device gallery app also.